We are proud to announce the upcoming release of a major update to our industry-leading reporting platform, Event Intelligence. This update will add significant back-end updates and front-end tools, allowing eshots to continue providing best-in-class performance and flexibility. Event Intelligence 5.0 will take the features from previous iterations and add new Marketing Sciences reporting, drag-and-drop cross-tab analysis, goal setting and the ability to access your data from any connected device. "We know that proving ROI is a huge challenge for event and experiential marketers so we created Event Intelligence 5.0 to make that easier," said Craig Steensma, founder and CEO of eshots. "We took our already industry-leading Event Intelligence platform and completely rebuilt it from the ground up. We made dramatic back-end improvements and added key reporting features that you won't find in any other event analytics platform." eshots' CTO Bill Bernahl added, "Other platforms in the market often provide inconsistent data, making it hard to trust the decisions you make. With Event Intelligence 5.0's rock-solid architecture you can feel confident that you are making the most informed decisions regarding your experiential program." 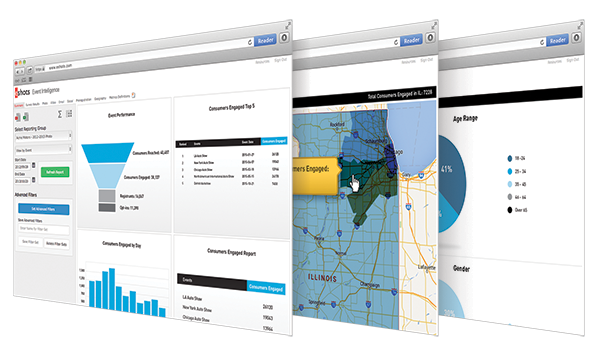 Event Intelligence 5.0 will be available to eshots clients beginning summer 2016.